Researchers have discovered a new way of emitting photons one at a time. They have constructed semiconductor nanowires with "quantum dots" of unprecedented quality - a discovery with implications for the future of quantum computing. In a future of quantum computing, data will be treated and transmitted by lasers. The quantum properties of light will endow machines with gigantic computing potential and an incredible execution rate. However, much work remains to be done. In order to exploit the "quantum" potential of light it is necessary, among other things, to be able easily to emit photons one by one. At the heart of the Laboratory of Semiconductor Materials (LMSC) of Institute of Materials, the team of Anna Fontcuberta i Morral has discovered a new method for creating a miniscule and extremely high-performance single-photon source. She has found that "quantum dots", or nanocrystals, appear naturally on a certain kind of semiconductor nanowire during their fabrication process. The final structure can then emit photos one by one, after having absorbed light. Her discovery is the subject of an article in Nature Materials. Nanowires, with a diametre of around a millionth of a millimetre (between 20 and 100 nanometres) are very efficient at absorbing and manipulating light. 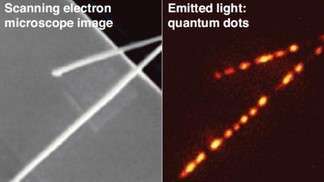 By endowing them with nanocrystals or "quantum dots" it is possible to make them emit unique photons, by charging them with a laser beam of a particular frequency. 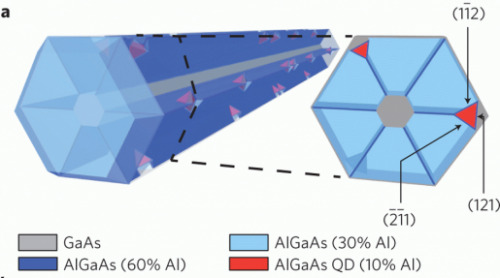 The only hitch is that generating quantum dots on a nanowire is notoriously difficult. The existing methods, which involve the use of a regular modulation of the composition of the nanowire all along its length, are hard to reproduce and result in strucures with a relatively low output of photons. Scientists at the LMSC discovered that perfectly functional quantum dots formed "naturally" on the surface of certain nanowires during the fabrication process. These dots appeared all by themselves at the interface between two basic components: Gallium Arsenide (GaAs) and Aluminium Arsenide (AlAs). "No doubt many scientists working on nanowires have created dots, without realising it," states Anna Fontcuberta i Morral. Many tests have been carried out in the light of this discovery, in order to prove the efficiency of this new single-photon source. "The calculations and simulations were carried out on the supercomputers of EPFL by the Laboratory of the Theory and Simulation of Materials (THEOS) of Nicola Marzari," says Prof. Morral. As a result, these structures showed a great working stability, which is rare when talking about nanotechnology. What is more they are hard wearing and very bright, which means that their rate of photon output is incredibly high. Even better, by controlling the fabrication of the nanowires, the size of the dots can be modulated and adapted to measure. The wavelength of the emitted photons, which is directly dependent on the size of the dots, can therefore be changed. It is then possible for the nanowire to receive a laser beam of a certain wavelength or "colour", in order to generate photons of a certain colour - infrared, for example. At the present time the phenomenon of the natural creation of dots is not understood by scientists. The study will therefore proceed in the following way: "It is also about seeing if it is possible to stimulate dots not only with lasers but electrically, in order to make them as compatible as we can with all kinds of machine," explains Anna Fontcuberta i Morral. It is worth noting that these photon sources could also be used in the domain of molecule detection, or for the perfection of methods of quantum encryption for the protection of data.